Feel free to customize any design below, or start from scratch and design your own! The text on the flags below is shown for example only. Our designer gives you the flexibility to personalize your putting green flag by changing text, colors or adding shapes. Choose from 1000's of images in our design tool art library or upload your own image. Have fun with it, the possibilities are endless! 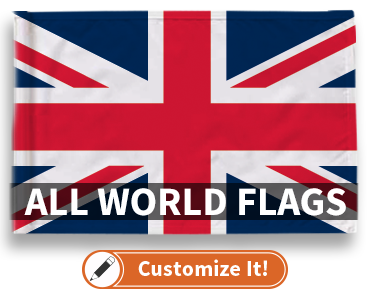 Each flag is made with the same high quality standards and attention to detail as all of our custom printed products are. Need help or have a question, just give us a call at 800-958-3009 and we'll be happy to help!